DAY 41. 17 JUNE 2016. 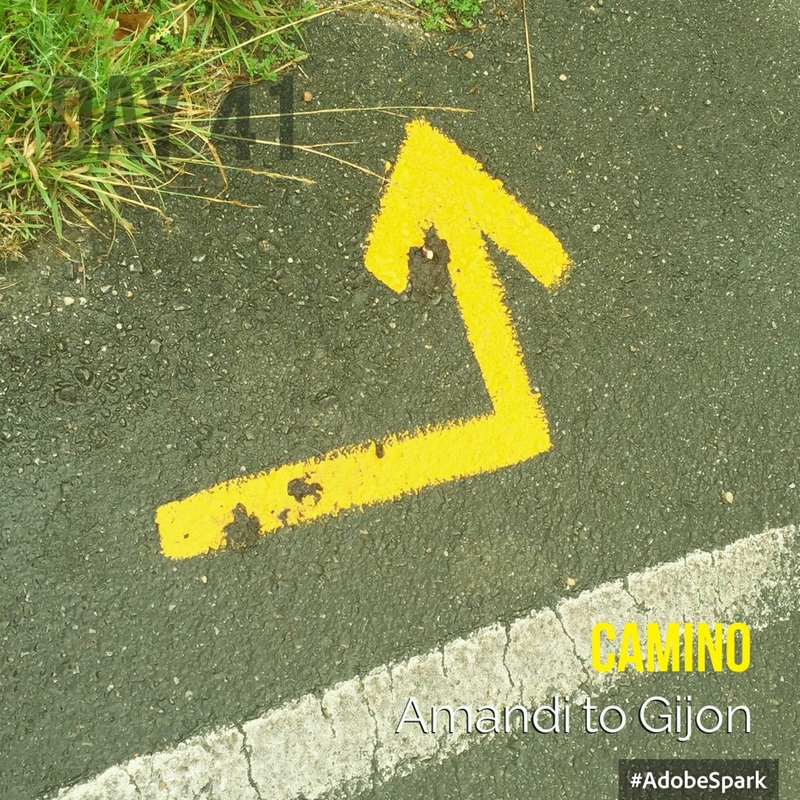 AMANDI TO GIJON. I woke up with a start at 6.55am as most of the dorm was up and packed. The 'surround-sound' snoring died down and I'd slept soundly, apart from when the cat landed on my feet- it's probably locked in at night to keep an eye on things. I'm always annoyed at my slow progress in the morning. However fast I try to pack, I'm always one of the last to leave. I jammed one of the zips on my pack today trying to go too fast. After lots of hugs and photos I'm off with the Red Hunchback in the wake of the Canadians, but after a few minutes I don't see them again. I seem to be in the wake of two Frenchmen who save me from whizzing off to Oviedo when the route splits. Just two yellow arrows painted on the road! It pours with rain all day and takes 2 hours of solid uphill walking to get up and over the mountain. Mainly on roads, but also on tracks running with water and deep mud in parts. Despite all that, it's a good hearty walk and it occurs to me that skin and hair are wonderfully waterproof; so after an hour of walking uphill in my poncho which becomes too hot, I resort to the tee-shirt, single pole and umbrella technique. Which is great until the wind picks up. I rest and watch the clouds go by. There are a couple of small bars enroute that provide some warm, dry comfort but it takes about four hours walking to reach the outskirts of Gijon, which is a big University city. Although I had been rather dreading the walk today it was fine in reality; all that is required is plenty of time and the ability to put one foot in front of the other. I took plenty of rests to admire the clouds drifting up the valleys. The temptation is to jump on the bus to miss out unpleasant bits of a journey (many do), but I enjoy the suburbs and periphery development. They give you a glimpse into ordinary urban Spanish life. Spain seems to be a very well run country. It feels well cared for and the new houses are generally large and spacious compared to ours. No high-density rabbit hutches here. I suspect they have managed to avoid the strangle-hold of a few house-building companies that dictate the UK housing supply and market. In fact, it feels altogether less corporate; there are still lots of local bakeries who deliver bread on a daily basis. People hang special bread-bags on their front doors. No Starbucks or Cafe Neros here either. So after an hour's walk through the suburbs I arrive at the albergue. It's a private and slightly more luxurious with beds, sheets and blankets and dinner and breakfast for 25€. The three Italians I've been following all day arrive at the same time. Camino life takes quite a lot of patience with fellow pilgrims sometimes; a woman barges into the shower room while I'm having a shower and then complains how small it is! There was a huge empty one just down the corridor. But it was nice and hot and it's good to get my wet clothes off. But the rain continues. This area is called green Spain and the rain falls mainly here and not on the plain! Supper is served at 8pm. I get the Pilgrims menu which is pretty unappetising. I manage to swap my fried battered chicken for baked vegetables, but I think I'll skip it in future! It's football tonight-Spain versus Turkey. It'll be noisy I expect- whatever the outcome. I heard that Jo Cox had been murdered via Facebook. What's been unleashed in the UK?